The author of the New York Times-bestselling graphic novel Woman Rebel: The Margaret Sanger Story returns with another extraordinary account of a woman way ahead of her time. In his newest biography Fire!! 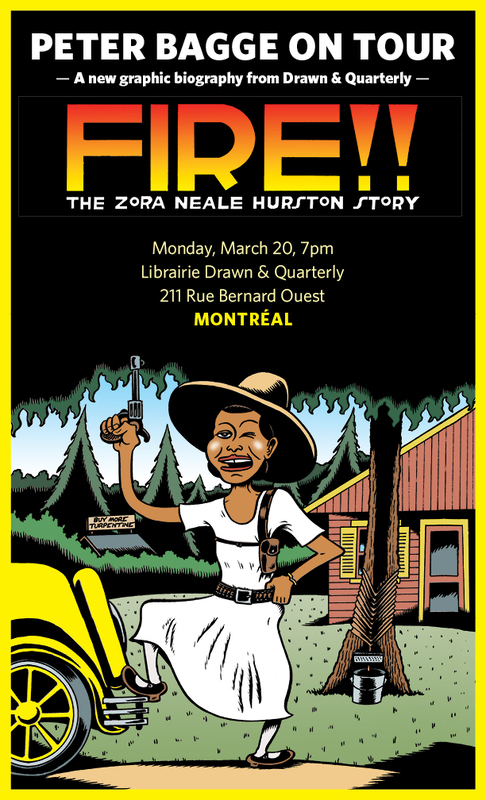 The Zora Neale Hurston Story, cartoonist Peter Bagge delves into the world of Zora Neale Hurston: the critically-acclaimed novelist and folklorist who challenged the norms of what was expected of an African American woman in early 20th century society. With a skilled cartooning hand, Bagge turns what could be a rote biography into a bold and dazzling graphic novel, creating a story as vibrant as the life itself. Join us for an unforgettable presentation on Monday, March 20th at 7:00 PM with a book signing to follow! PETER BAGGE is the Harvey Award-winning author of the acclaimed 1990s alternative comic series Hate starring slacker hero Buddy Bradley, and a regular contributor to Reason magazine. A graduate of the School of Visual Arts in New York City, he got his start in comics in the R. Crumb-edited magazine Weirdo. Fire!! The Zora Neale Hurston Story is Bagge’s second book with Drawn & Quarterly after 2013’s Woman Rebel: The Margaret Sanger Story, which was reviewed twice in the New York Times, and appeared on the YALSA Great Graphic Novel For Teens list and the Amelia Bloomer Project list of the Best Feminist Books for Young Readers. Bagge lives in Seattle with his wife Joanne, daughter, and three cats.